By combining the advantages of cryptocurrency (speed, privacy, decentralization, low fees) with traditional fiat banking systems (transaction records, account names, electronic statements, accounting software integration) BitCash is the world’s first truly decentralized cryptocurrency designed to facilitate real world trade between consumers and merchants with a goal of becoming the world’s most used cryptocurrency. You can now BitCash to anyone on Twitter using only their Twitter handle. Gone are the days of having to send and receive complex cryptocurrency addresses just to send someone cryptocurrency - and even though BitCash already has easy to use nicknames, we’ve taken it a step further so now all you need is anyone’s Twitter handle and you can instantly send them BitCash. The community’s goal with BitCash as we’ve communicated consistently is mass adoption and ease of use. 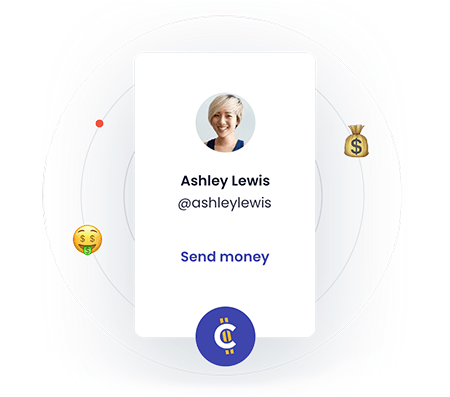 We feel that this takes BitCash a step further in making it seamless for anyone to send and receive cryptocurrency in seconds. Want to tip your favourite Twitter celebrity? Maybe accept payment for a retweet to your followers, or even run a competition on Twitter. The potential is only limited by your creativity and we’re excited to see what the community does with this new feature. 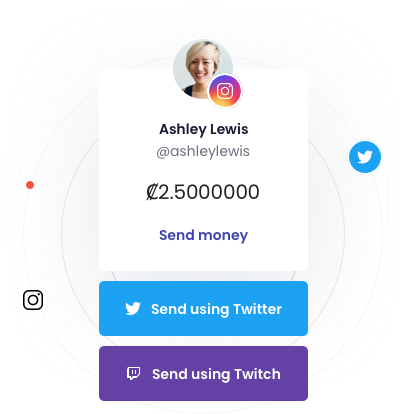 The Twitter feature allows users to easily send BitCash to any Twitter account by simply inserting the receiver’s twitter handle in the recipient section in the new BitCash wallet. The BitCash wallet will then create a link that you can post on twitter or send it to the receiver by email, chat, or any other medium. Only the receiver (the owner of the twitter account) will be able to claim the coins. If someone else tries to click on the link, they won’t be able to access the coins. Only the intended receiver can ever access those particular coins, and importantly, they don’t need a BitCash wallet. This feature will allows others on twitter to see you giving the coins away if you post the link as a new tweet tagging the receiver or if you comment on the receiver’s tweets, which will increase awareness of the BitCash project. We encourage the BitCash community to leverage this exciting feature and post their links on Twitter to increase BitCash exposure. 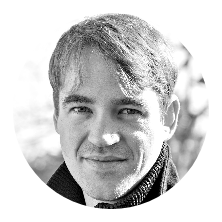 With named accounts, there is no more fiddling with messy blockchain addresses designed for geeks and crypto enthusiasts. 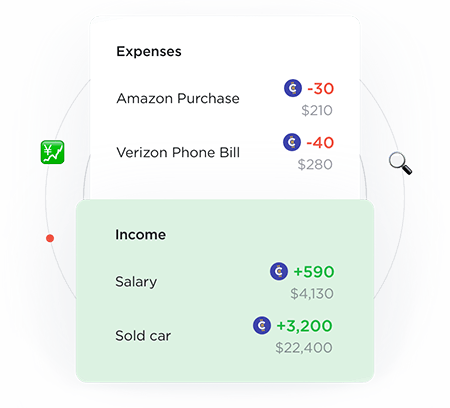 Buyers using BitCash can enter in a private record which is only visible to the buyer and seller - this creates stored transaction records making it easy to see where your money went, manage your cashflow and plan for taxes. 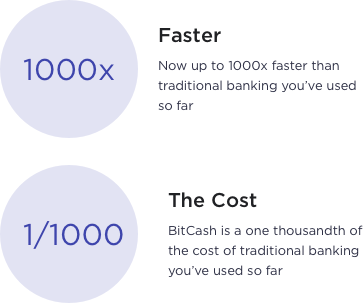 Using the power of blockchain and super fast transaction speeds, BitCash allows you to send money across the world faster and cheaper than traditional banking. 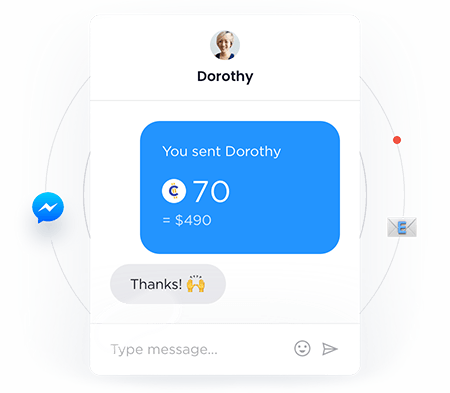 Just like PayPal, Bitcash allows you to send money to anyone via email, chat or sms if they don’t yet have a Bitcash wallet, making paying bills, or sending money to friends and family a breeze. BitCash Stable addresses the problem of price volatility when sending money to a third party, paying retailers, or storing value. BitCash Stable secures the value of BitCash for the short, medium, and long term, making it easier to integrate into the financial system. If, for example, you pay someone in BitCash (or any cryptocurrency for that matter), they must accept the risk that its value might fall before they can convert it to local currency. Few people would accept such risk, even if it was faster, cheaper, and safer than PayPal or wire transfer. The same applies to online retailers. When accepting BitCash, they must immediately convert it or risk it losing value. 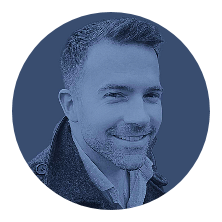 Instant conversion might not be a problem for one-off transactions, but when it reaches ten, twenty, a hundred, or more, it becomes very time-consuming, costly, and risky. You want to maintain the value of your long-term cryptocurrency holdings, too. In the physical world, investors usually turn to gold as a secure store of value, but in the cryptocurrency world, there really isn't a reliable stable cryptocurrency that doesn’t rely on third parties. With the new BitCash stable feature, there are now two currencies stored on the blockchain, BitCash and the BitCash Dollar. There are also two currency accounts in the wallet. Say as of 1 January 2019 the price per BitCash is US$0.10, and on this day you send 5,000 BitCash to your BitCash Dollar account. At that time, you will immediately have 500 BitCash Dollars in your BitCash Dollar account with a value of US$500. You can keep the 500 BitCash Dollars for as long as you want and they will never change in value. Now assume the date is now 10 January 2019 and the price per BitCash coin has dropped to US$0.05. If you were to then convert the BitCash Dollars (still worth US$500) into BitCash, you would get 10,000 BitCash. So, the amount in BitCash is now 10,000 instead of 5,000, but the value in BitCash Dollars is still US$500. So when you hold your money in a BitCash Dollar account, the value will always remain the same. Keep in mind, you can send the money from one BitCash Dollar account to another BitCash Dollar account. 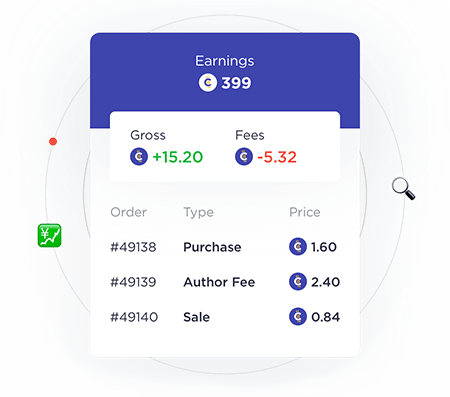 You can also make payments in BitCash Dollars directly and there will be no price risk for the merchant. The benefits of this feature are groundbreaking. With the BitCash Stable feature, you can send US$1,000 to someone across the globe and they would receive it in less than a minute with minimal fees , no conversion fees on each end, no middle man, no hefty transaction fees for both parties, and no having to wait days for funds to clear. Not even Paypal can do this. 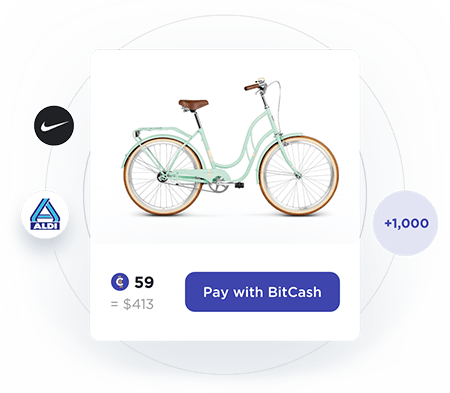 Also, if you’re running an online store, you can now accept BitCash without having to sell instantly, but instead hold the coins in your BitCash Dollar account until you’re ready to sell. This will help entice more online merchants to accept BitCash and/or BitCash Dollars. Cryptocurrencies have a problem. The blockchain (the network that stores transactions) is public, that means anyone that knows your wallet address can see your transactions. Privacy cryptocurrencies such as Monero attempt to solve this however, law enforcement agencies despise this as it fosters illegal activity including tax evasion and money laundering. A growing number of governments and exchanges have banned privacy cryptocurrencies. This is where BitCash comes in. BitCash uses a sophisticated algorithm to make sure your transactions are private to the general public. 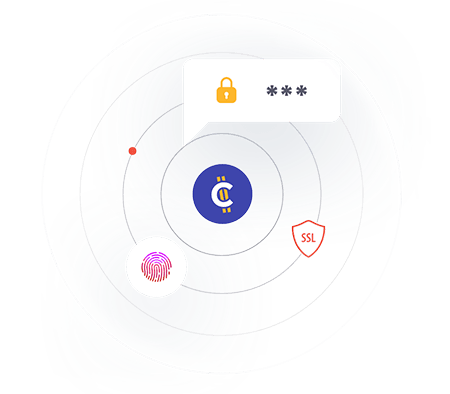 However, the BitCash blockchain has a master-key that enables governments, law enforcement agencies and exchanges to explore the network as if it were public - similar to the Bitcoin network. This is best of both worlds -- just like your bank account where you have "Safe privacy". Privacy from prying eyes that deters illegal activity. Bitcash is the first and currently only cryptocurrency to provide "safe privacy". 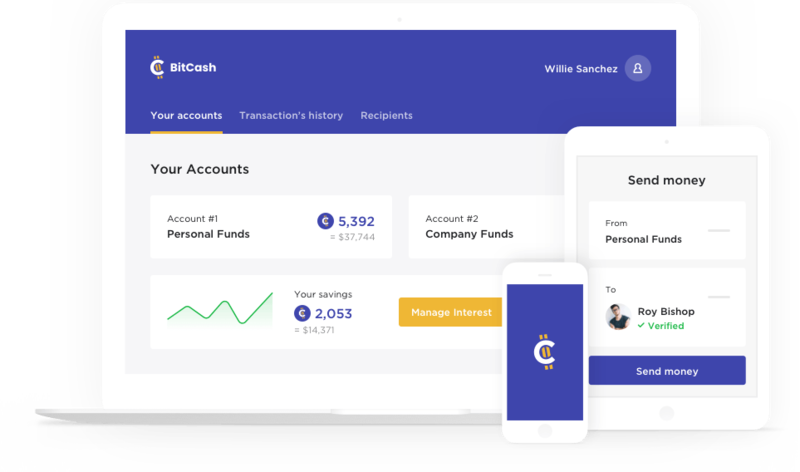 Just like your normal online bank account, the BitCash wallet will allow users to create and label various accounts within the one wallet to help consumers and merchants organise their transactions. Your internet banking allows for easy statements, why shouldn’t your Crypto? With statements, both consumers and merchants can keep healthy records of their transactions. 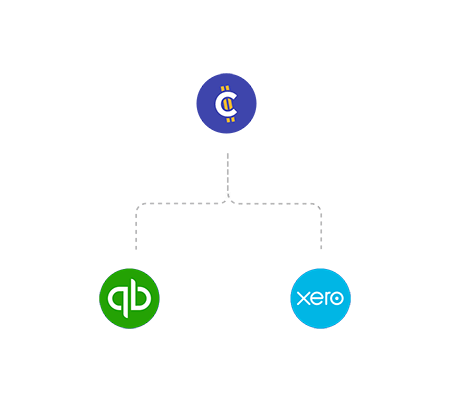 Running a real business requires perfect transactional record keeping. 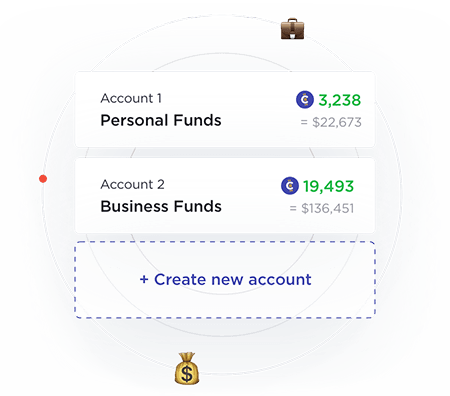 BitCash allows you to import your transactions directly into your accounting software for easy bookkeeping and tax time. Use BitCash to pay bills directly from your wallet in seconds. 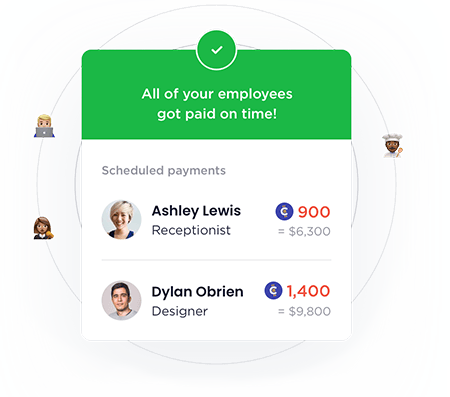 Paying employees with crypto just became easier. 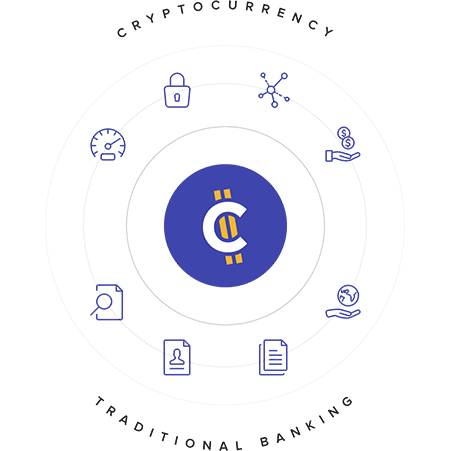 Set and forget, you can now pay your staff with cryptocurrency just like you can with traditional banking software. Consumers can also now pay for their favourite subscription products using crypto. BitCash is accepted on thousands of online stores so you can buy online easily and privately. View our list of merchants. Unlike traditional cryptocurrencies, BitCash aims to solve both the consumer and business sides of money transfer, payments, record keeping and accounting. BitCash is being designed and built from the ground up with one goal in mind - increase user adoption. BitCash Stable Two currencies stored on the blockchain, BitCash and the BitCash Dollar. Safe Privacy Provides bank level privacy to your transactions but still deters bad actors. Accounts with Nicknames No more fiddling with long character addresses. Nicknames make cryptocurrency transactions easy. Stored Transaction Descriptions Using BitCash is just like paying with your credit card and bank account. See where you've spent money with ease. Send to Anyone Just like PayPal - you can send BitCash to anyone in the world, even if they don't have a BitCash address, nickname or wallet. Send to Twitter Tip anyone on Twitter, Instagram, or Twitch. One Click Mining Simply open your wallet and click "Start Mining" to earn BitCash. It doesn't get any easier than that. Verify Before Sending The BitCash wallet verifies that a BitCash address or Nickname exists before you can send to that address. Some of the BitCash contributors and volunteers have decided to remain anonymous as they take anonymity very seriously. 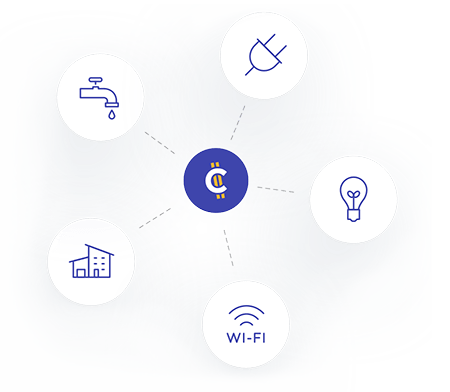 BitCash is a community-based project with no ICO and no central entity controlling the protocol. The BitCash project has no physical offices or any employees. The network is coded, designed, and run by volunteers that live in all different parts of the world and anyone is welcome (and encouraged) to contribute. 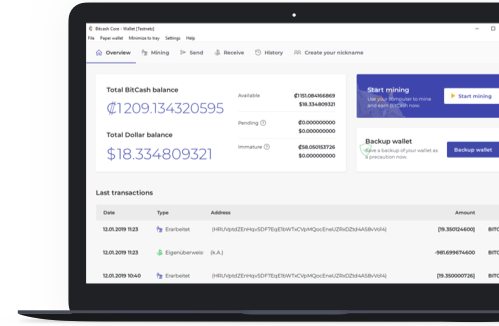 Click below to download the BitCash wallet onto your Windows or Mac computer. Use the wallet to receive or mine BitCash. BitCash is Proof of Work coin and is a direct BitCoin v0.16 fork. BitCash also uses stealth addresses from Monero but enhanced with our master key to help deter bad actors. BitCash is a new and experimental protocol, so be cautious. There is no expectation of “profits” as this project is a protocol. BitCash coins are a means to transfer wealth and shouldn’t be considered as an investment. BitCash software is open source and issued with no guarantees. No money was ever raised for the development of BitCash. All work conducted on BitCash is done so by volunteers around the world. By mining, trading, or acquiring BitCash by other means, you acknowledge that this is not an investment into a company or any such centralized entity. BitCash is an entirely open source project whereby anyone is able to volunteer and contribute. As this project is developed by the community, there is nobody solely responsible for the success or failure of BitCash. The BitCash project has no physical offices or any employees. The network is coded, designed, and run by volunteers from all around the globe, and anyone is welcome to contribute. Furthermore, no ICO or fundraiser of any kind ever took place. All code is given away and published as open source.